"Win ♦ Prevail ♦ Conquer ♦ Triumph ♦ Beat ♦ Achieve ♦ Finish ♦ Excel ♦ Succeed ♦ Overcome"
"100 Women In Gold" supports women student-athletes at Fort Valley State University (FVSU) through several different types of fund-raising events. Please read about each one of these tremendous events and we look forward to your participation. 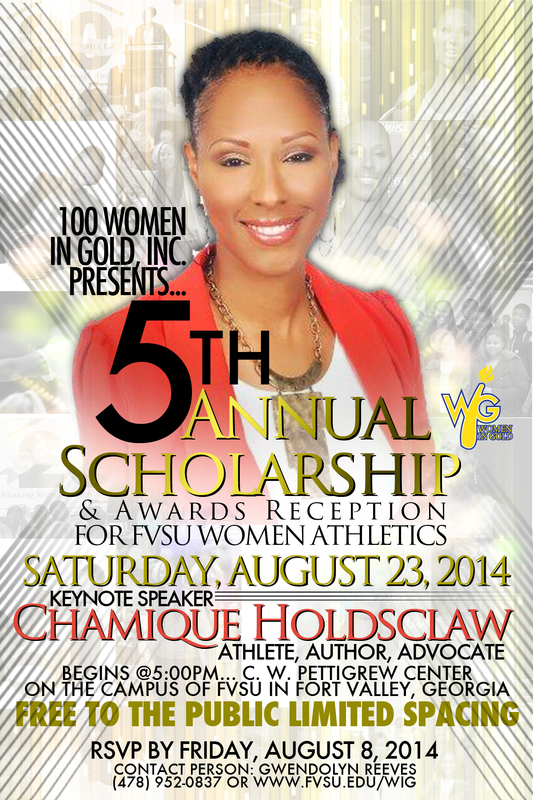 100 Women in Gold, Inc. presents its 5th Annual Scholarship and Awards Reception for FVSU Women Athletics, Saturday, August 23, 2014 at 5:00 p.m. in the C.W. Pettigrew Center at Fort Valley State University. The keynote speaker will be Chamique Holdsclaw - Athlete, Author and Advocate. This event is free to the public but seating is limited. RSVP by Friday, August 8, 2014 to Gwen Reeves at 478-052-0837 (click here to see flyer). Chamique Holdsclaw is a former professional basketball player in the Women's National Basketball Association (WNBA). Also, she is a 2000 Sydney Women's Basketball Gold Medalist representing the USA, an author("Breaking Through: Beating The Odds Shot After Shot"), and an advocate for Mental Illness. In 2006, Holdsclaw was named to a women's collegiate basketball silver anniversary team for being picked as one of the 25 greatest players of the past 25 years. She was also picked as one of the 5 greatest players in the SEC of the past 25 years. Holdsclaw is a member of Alpha Kappa Alpha Sorority Sorority, Inc. Copyright © 100 Women in Gold, Inc. All Rights Reserved.